Capture both sides, other side only or this side only. Easy to use recording panel. Free for a limited time! Record direct to MOV, MP4 & M4A. Record Skype Mac Free – Skype Video & Audio with No Time Limits! Update 11th August 2014 – Microsoft / Skype have now withdrawn support for SkypeKit – the technology we used to build VodBurner for Mac. As a result of this, you can no longer sign-in to VodBurner for Mac unfortunately. Note: our Windows version of Mac is not affected. We don’t use SkypeKit in our Windows version of VodBurner and therefore our Widows version is not affected. You can download a free trial of our Windows version – it’s a great app. Our Windows version lets you record, edit & upload to YouTube all within the app. We apologise to all our VodBurner for Mac fans. Capture Video & Audio to MP4, MOV & M4A for Free with absolutely no time limits. VodBurner for Mac is easy to use and you don’t even need to have Skype installed on your Mac. Skype is built-in to our app. You login to VodBurner with your Skype username and password and we take care of the rest. Record Skype Mac Free with VodBurner. (*Other recording products may cause VodBurner to malfunction, so it’s important you close Skype if you have one of these. 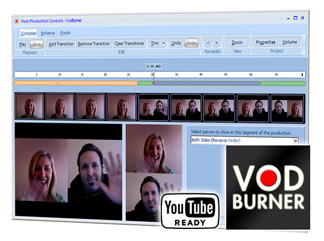 You don’t need Skype running in order to make and record calls with VodBurner). “What you see is what you get” recording panel. Record direct to MOV, MP4, M4A and other formats. Record video + audio or audio only. Capture both sides, other side only or this side only. Switch between sides with hotkey during call. Choose between letterboxed or zoomed view. Recording is available instantly after the call. 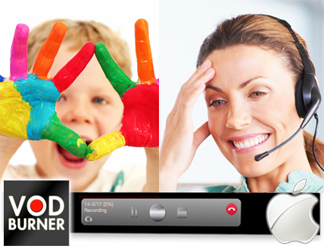 Make and receive calls directly from within VodBurner – no need to start Skype. Record Skype Mac Free Download. VodBurner for Mac offers a “What you see is what you get” recording panel. Completely free – record with no time restrictions or limitations. Record Skype Mac audio only calls. Record video + audio or audio only to MOV, MP4, M4A and other formats. Lots of flexibility – capture both sides, other side only or this side only. Free – for a limited time! For a limited time, VodBurner for Mac is totally free. Get started recording Skype video on Mac for free today. If you get stuck, don’t worry. We’ll help. VodBurner for Mac offers a “What you see is what you get” recording panel. Completely free - record with no time restrictions or limitations. Record video + audio or audio only to MOV, MP4, M4A and other formats. Lots of flexibility - capture both sides, other side only or this side only. Free - for a limited time! Looking for VodBurner for Windows? Rock solid Skype recording. Revolutionary editing. Create complete video production from Skype video calls.